Today’s media-savvy consumers are inundated by visually rich experiences designed to engage and entertain them wherever they go: a clothing store, museum, corporate business, airport and even the hospital. Individuals want to be digitally connected throughout their day, whether at work or play, as soon as they enter a space. Dynamic imagery, touchscreens and social media integration are all ways that companies are reaching out to capture the minds and wallets of consumers, with the goal of maximizing revenues and creating lifelong customers. And for good reason: Digital screens improve recall and increase dwell time, resulting in a 3% to 5% uplift in sales, and as much as a 40% increase in brand recall. Although cinema auditoriums have transformed significantly during the past decade, adopting the latest laser-projection and immersive sound technologies, these investments have been devoted solely to improving the movie-watching experience. However, millennials and the up-and-coming Gen Z demand more for their entertainment dollar. Theater owners need to deliver an all-encompassing moviegoing experience that is animated, exciting and digitally interactive, capturing customers’ interest the moment they enter the building. One way is to enliven a highly valuable, yet underutilized, portion of real estate in their theaters: the cinema lobby. Today, we are seeing a new movement of technology integration that is just in its infancy and is being welcomed as a new vertical market opportunity: a fully digitized, multimedia cinema “lobby experience” designed for a new generation. It has vast potential for turning an ordinary lobby into an engaging, revenue-generating entertainment center. It’s not a matter of “if” but “when” theater owners want to ride the next wave of growth and attract a loyal audience of future fans. The cinema lobby represents the first opportunity to engage and sell to a customer. Typically, a customer spends an average of 12 minutes in a cinema lobby, and most of them are primed and receptive to relevant promotions. By transforming the cinema lobby with multiple screens, advanced audio features and high-impact lighting, theater owners can create a “show before the show” that influences and entertains a customer. An immersive cinema lobby can set the tone for a richer, more satisfying—and more profitable—movie-going experience for customer and exhibitor alike. 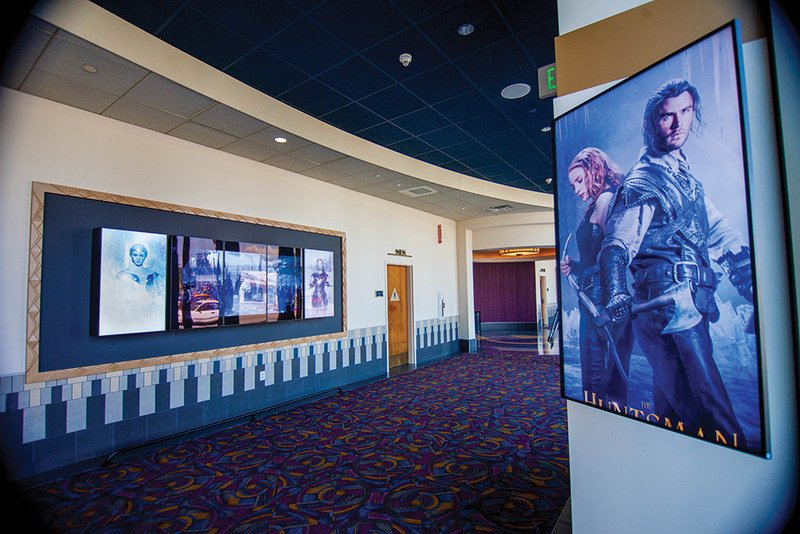 Theater owners can create this by using a combination of custom multiscreen arrays, dynamic movie posters and animated box-office and concessions menu boards, either individually, or combining them to design a synchronized show that captivates and entices moviegoers with a multitude of offers. Social media functionality can even be integrated into the system to further engage customers and drive advance ticket, concessions, souvenir and gift certificate sales. The prospect of creating a fully digitized cinema lobby can seem daunting to a theater owner, from designing the space, to choosing AV equipment, to networking everything, to keeping content fresh and creative. How does an exhibitor ensure that his investment in a lobby experience will pay dividends? AV integrators need to play both an educational and service role when it comes to securing these projects, often selling exhibitors on the value proposition of outfitting their lobby with the latest innovations in networked digitally animated signage, as well as acting as a consultant throughout the lobby installation. Working with a strong, well-established AV technology partner, the knowledgeable AV integrator can help an owner devise a strong business case, plan and design, and navigate the inevitable challenges of creating the ultimate entertainment experience. Last spring, Diversified Media Group (DMG) was selected by Barco to work together in developing a brand new digitally enhanced cinema lobby at the L.A. Live entertainment complex in Los Angeles. While Barco offered its expertise in cinema technology in commercial projection and sound, DMG brought many years of design and engineering experience and knowhow on major AV projects to the table. The team embarked on a simple five-step process to transform the static theater lobby into the ultimate cinema lobby in four short months. Because L.A. Live was an existing theater, the process began with a simple site survey to identify key paths of travel and determine how all the spaces were being used. The challenge in this model was that the team had to overcome some preconceived ideas of how the lobby operated, and sell the new paradigm of a digital lobby. Had they been working with a brand new theater, the team could have influenced the actual design of the space and would have had more creative freedom. Once a preliminary layout was established, the team explored current AV technologies (LED, LCD, sound systems, lighting, projection) to determine what best fit the space and objectives. The result of this phase was a floorplan depicting all of the locations, applications and recommended equipment. During this phase, DMG’s design team generated renderings and budgets for all of the display elements, offering several options, from basic to premier. Projection mapping, rear projection and LCD arrays were a few ways to create a visually engaging presentation. The L.A. Live site had a great deal of ambient light that required the team to test several types of displays. In designing a next-generation cinema lobby, it’s important to consider not just the upfront cost of the equipment, but also the operating costs, especially ongoing demands of content management. One way to keep expenses down is to create elements based on 16×9 or 9×16 aspect ratio, enabling content to be used in multiple ways. The next step was to develop a content strategy, the heart and soul of the lobby experience. For L.A. Live, the team created a storytelling environment using multiscreen arrays, videowalls, movie posters and animated box office and concession menu boards. In addition, the team designed and implemented a synchronized, multiscreen 30-second “spot” for the purpose of advertising feature film releases and specific promotions, complete with custom audio, video and lighting effects. This is located in the lobby area and throughout the hallways leading to the theaters. The theater owner can then add localized content to the rotation, such as concessions or event promotions, which coexist with asynchronous content, such as trailers and posters for upcoming releases and broader event promotions. When seeking an AV technology partner for a digitally immersive cinema lobby, it’s vital to join forces with a company that can be agnostic when it comes to equipment selection. It’s also important that a partner have the breadth and depth of display options, and the necessary understanding to work in a collaborative manner with expert engineers and specific design plans, all of which were essential in making the L.A. Live project a success. However, equipment is not the only item to look for in a partnership. The integrator should choose a partner with strong studio and exhibitor relationships, as well. Without these, obtaining content from the studios can be quite difficult, eliminating opportunities to develop those dynamic multiscreen presentations used to promote upcoming theatrical features. Once all of the equipment was selected and tested, the team worked together with L.A. Live on a tightly scheduled installation plan. One of the challenges was that they had to avoid impacting any revenue-generating areas of the theater, which would be operating “business as usual” (with a few special events!) throughout the installation period. Working with L.A. Live’s in-house contractors, DMG was able to value engineer the project based on their detailed knowledge of the facility. They strategically located “back of the house” equipment for maximum efficiency and to minimize disruption to the existing infrastructure. Then, DMG moved the AV racks from the fourth floor to the second floor to save on both manpower and materials costs. Thanks to tight coordination of the installation tasks, they were also able to capture savings in the lift rentals. Although creating an attention-getting experience in the lobby is largely based on having dynamic visual displays that deliver engaging images, it is also important to consider the added value of audio as an important immersive element. Audio pulls in the additional sense of sound, and when combined with sight, helps to deepen the enveloping experience of a digitally enhanced cinema lobby. To achieve this, the team selected Harman audio components: JBL CBT 70-1 + 70JE-1 speakers with Crown DCI2x1250 amplifiers in the atrium, and Control 47HC with DCI2x300 amplifiers in the hallway. The audio processor is a BSS BLU-160. This configuration provides the directional control of the sound required.